The Western Slope Conservation Center is bringing our community stewardship program to new heights in 2018! What is stewardship? The dictionary definition is, the job of taking care of something, especially something worth caring for and preserving. Today more than ever, public lands are under threat. Under threat of being overused, overloved, and overworked. 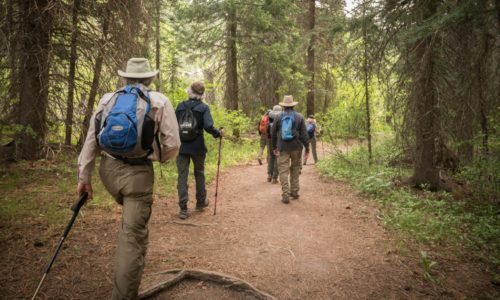 As avid users of the public lands, trails, and forests it is our responsibility to also look out for them! Stewardship is giving back our time and effort to protect and care for the land that gives us so much. Our 2018 season was wildly successful! Check out all of the projects WSCC volunteers worked on here. Interested in digging into some more hands-on stewardship work? 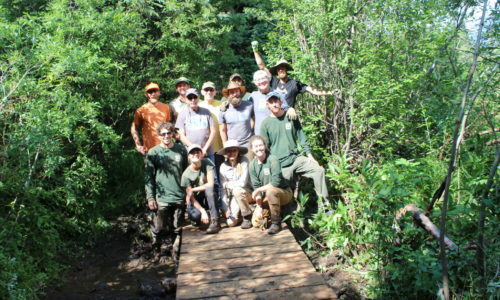 In collaboration with the U.S. Forest Service, the Conservation Center puts on trail work days every summer in the GMUG Forest. The work done at these events is highly varied – every project is different! Past projects have included installing low bridges over wet areas, creating turnpikes, fixing tread, removing brush that is encroaching on the trail, and more. Every work day is an opportunity to learn about trail management, the GMUG Forest, have fun, and give back! This summer, the Conservation Center is focusing its stewardship efforts on two Wilderness Areas of the GMUG Forest – the Raggeds and the West Elks. With rugged tablets provided by a generous Wilderness Stewardship Alliance grant, volunteers will provide relevant trail, user, and environmental monitoring data to the Forest Service. This shared information will then be used to prioritize and plan work and management of Wilderness Areas. FIND OUT WHICH TRAILS STILL NEED TO BE MONITORED HERE!! To learn more about volunteer opportunities, e-mail holly@theconservationcenter.org, give us a call at 970-527-5307, or stop by our office in Paonia.